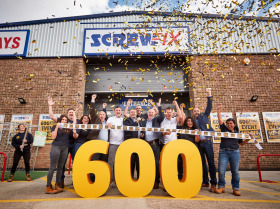 Screwfix has opened its 600th store – a major milestone for the UK retailer which has added 100 new stores to its network in the past 18 months. Since opening its first store in Yeovil in 2005, Screwfix has grown significantly, with 97% of the UK population being within a 30-minute drive from their nearest store. Screwfix is on track to open 50 stores in 2018, with many more planned for 2019. A thorough break down of the company’s plans will be available in DIY Week’s 12th October issue.